Is it time to stock up on industrial cleaning supplies such as rubber gloves, spray glass cleaner and sponges? But did you remember the maintenance supplies such as the light bulbs, handtrucks and ladders? All are part of industrial cleaning and maintenance. Whether you work in an office building or in an industrial facility, you need the right types of industrial cleaning supplies. 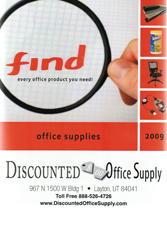 That’s why Discounted Office Supply.com has gathered the largest inventory of janitorial cleaning supplies and maintenance supplies on the Internet. We pride ourselves in our huge selection, great prices and superior service. When you order janitorial supplies from us, you’ll get your order quickly. That’s because we ship your supplies from one of our 36 geographically located distribution centers throughout the United States. Browse our maintenance and janitorial cleaning supplies categories below. Find everything you need and order today!